Getting back to writing after a week away was nerve-wracking. I find the longer I leave writing, the more stressed and distracted I get. After a week away I was having nightmares about forgetting exams (I'm not due at any exams) and leaving my kid in the supermarket (I do not have a kid). I had to push myself even more than usual to sit down each day, as a break from writing always engenders a loss of confidence in my story and my ability to tell it, but eventually managed to finish chapter 2 while still on holiday in Shropshire, and wrote chapter 3 back in London. 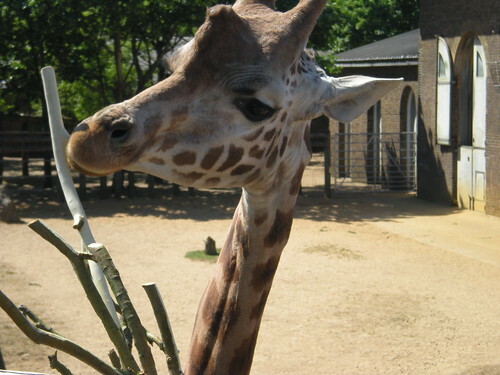 I also saw a giraffe. I got a lot done, enough to make up for lost time the previous week, but I'm worried I'm too focussed on the word count, checking it every few minutes in the hope that I’ve hit my target. It was something I was warned about at the writers' retreat I attended in January. I enjoy writing without thinking, because great ideas come out that I'd never have had while planning and not being fully in the story and alongside my characters, but they are often ideas that would be better placed elsewhere, in a later or earlier chapter. I write them anyway, and pin them in the right place to the board, ready to be moved about when I next think about the overall story. Writing like this also forces me to make decisions fast – does she have a brother? What's her relationship with her mother like? – rather than deliberate for hours over a character chart, but the lack of plan makes me anxious, and I worry I'm not making the right decisions, not writing the best that I could. I'm unsure about my sentences, my dialogue, the interest of what I’m writing. It makes me feel like I'm writing for the sake of it, pushing onwards to make my word count target. That doesn't feel right, though I can also see the benefit in getting a (crap) first draft done, so I’ve got something to work with. It's crap because it's not what I want it to be. I have this idea of my story, and the reality does not live up to it. It's a humbling process. Is it still worth pushing on and getting everything down, do you think? Or stop and fix the problems as they crop up?